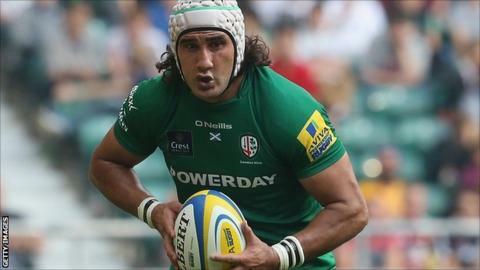 London Irish back-row forward Blair Cowan has signed a new deal keeping him at the Premiership club until 2018. The 28-year-old openside flanker has made 32 appearances for the Exiles since joining in March 2013, scoring seven tries. Cowan made his Scotland debut on their tour to North America last summer and he has six caps in total. "I've enjoyed my time so far at London Irish and was stoked to extend that by a further two seasons," said Cowan. "London Irish has opened doors to international rugby and I believe the club will constantly improve my game. "There are exciting times ahead for London Irish and I'm keen to be a part of that." Director of rugby Brian Smith said the new deal was a reward for Cowan's fine form. "Blair has been outstanding since first arriving at London Irish," said Smith. "His work ethic in training and on the park sets a great example and he is fast becoming a real leader in the squad. "He has made the step up to international rugby seamlessly and fully deserves to be playing at that level." Cowan was born in New Zealand, but qualifies for Scotland through his mother. Glenn Delaney, forwards coach at London Irish added: "Blair has all the defensive and attacking attributes a coach is looking for in an openside flanker. "He carries strongly, defends well and is fantastic over the ball. He is a player who is continually developing and one we believe can keep getting better."